Since starting my blog in August of 2012, I have written at least one or two articles a week. While I have been lucky enough that all have met with some success, by far these 5 are my most popular. Different in subject matter, each found their own audience and have continued to be viewed regularly. My top piece has been “Memorial Day Observation: In Thanks and Remembrance”. These are also the beliefs that drive our nation’s Small Business Owners! In “4 Reasons Why Small Business Owners Need to Use Background Checks”, my goal was to explain the true value of screening during the hiring process. Many small business owners still believe that background checks are only for the “big boys”. They underestimate how using them properly would actually help them save money and time. That is why I think this article continues to be viewed, despite originally appearing in early 2013. Those running small businesses are looking for information to clear the confusion! Another article that continues to be popular is “6 Tips on Using Background and Due Diligence Checks in Your Business”. Once the importance of background checks is understood, these tips help Small Business Owners use them to their best advantage. Many are unsure of how to go about getting quality checks. From choosing a screening company wisely, to knowing who to screen, it is important to have a working knowledge of how background checks benefit you. As my company motto states (taken from the words of former President Ronald Regan); the key is to “Trust but Verify”! My 2 part series on Social Media and Background checks is also widely viewed.....and it seems to have struck a chord with many. In the first installment, my goal was to outline how you can safely and effectively use social media to get a better picture of your potential hire. The most important takeaway here is that companies need to be careful to not request passwords to access any sites. In part 2, I looked more into the importance of writing a clear and concise policy to cover employee use of social media. I outline 5 things a good social media policy needs to include to protect both your company and your employees’ freedom of communication. I think it resonated with many as this topic is a “hot button” issue for many companies. 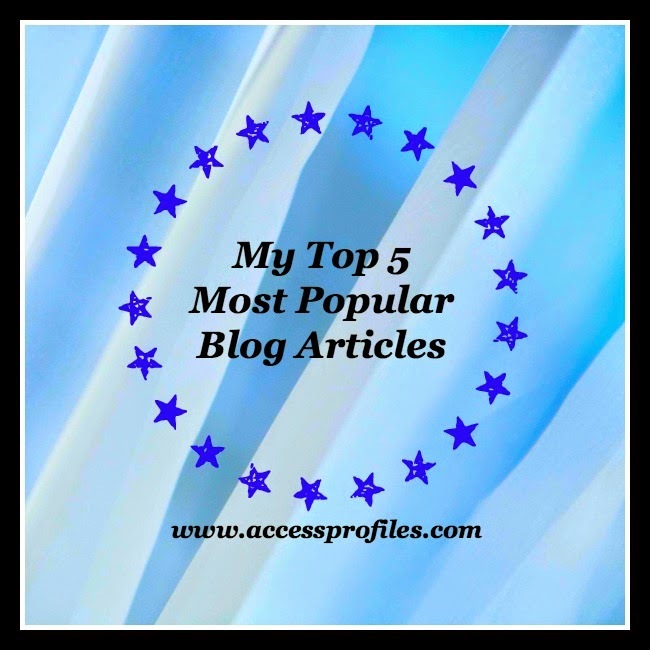 Finally, I include in these Top 5 my piece titled “Why You Should Run a Background Check on Yourself”. This is definitely one of the most frequently clicked on articles I have ever written. Doing a background check on yourself is certainly one of the most important things you can do. It is a great way to know what is “out there” about you, whether you are in the hunt for a new job or not. Many times you will find things that you either forgot, or you didn’t even know, were posted. I firmly believe that “forewarned is forearmed”. These are the articles currently in my Top 5. I invite you to check them out and to take a look at others I have written by going to www.accessprofilesblog.com. I would also like to thank my readers for your support of my blog and your kind comments along the way. I am very grateful! Be sure to take a look at my website, www.accessprofiles.com, for more on what Background Check and Due Diligence services I offer. I can help answer any questions you may have and will put you on the right track for making sound hiring decisions.